What is Kenny Smith know for? An American retired professional NBA player and Basketball Analyst. Where is Kenny Smith grew up? Kenny Smith was born in Queens, New York and he was raised in LeFrak City. He was brought up by his parents Annie Mae Smith and Kenny Smith Sr. alongside his brother, Vincent Smith. He got his education from Archbishop Molloy High School where he played basketball and was named a McDonald’s All-American in 1983. From there, he moved to the University of North Carolina where he joined Michael Jordan. He left great marks in the school that by 2016, he was the second best in terms of assist on the history of the school with 768 and the fourth in steals with 195. What is the profession of Kenny Smith? Smith developed the Bobby Lewis Basketball Skills Development Program, a training regimen that he presented at basketball camps around the country. Smith attended several of his lectures while in high school, and continued to use Lewis’s drills throughout his basketball career, and teaches them at his own basketball camps. As a freshman, Kenny Smith joined Michael Jordan on a North Carolina team that was a Pre-season #1 and finished the season ranked #1 with a 28-3 record. During his career at North Carolina, Smith averaged 12.9 points and 6.0 assists per game, while shooting .512 from the field, and .823 from the free throw line. Smith represented the United States in the 1986 FIBA World Championship, on a team that included players such as David Robinson, Muggsy Bogues, and Steve Kerr. He was second on the team in scoring behind Charles Smith with 14.7 points per game. Smith scored 23 points to lead the USA to an 87-85 win and the Gold Medal over a Soviet Union team that featured Arvydas Sabonis. Smith was selected as a point guard by the Sacramento Kings with the sixth pick of the 1987 NBA draft. He was named to the NBA All-Rookie Team (1st Team) after averaging 13.8 points and 7.1 assists per game for the Kings. Smith began his NBA career playing for Hall of Famer Bill Russell, who was the head coach for Kings until he was fired 58 games into the ’87-88 season. Smith was traded to the Atlanta Hawks midway through the 1989–90 season, where he was a reserve player for the first time in his career, averaging 7.7 points per game while only starting five of thirty-games he played for the Hawks. After the 1989–90 season, Smith was traded to the Houston Rockets, where he would spend the next six seasons. The Rockets released Smith after the 1995-96 season, and he signed with the Detroit Pistons. He played only nine games with the Pistons before he was waived and signed by the Orlando Magic, who released Smith after only six games. Smith then signed with the Denver Nuggets, where he would remain for the rest of the season. In his professional career, Smith scored 9,397 points (12.8 avg. ), recorded 4,073 assists (5.5 avg) while shooting .480 from the field, .399 from three-point range, and .829 from the free throw line. He finished in the NBA top ten in three-point percentage three times (1992–93, 1993–94, 1994–95), and top ten in free throw percentage twice (1992–93 and 1993–94). In the 1988–89 season Smith was fifth in the league in minutes played, seventh in minutes per game, and tenth in total assists. Smith’s career three-point percentage of .399 still ranks 42nd in NBA history. Smith holds the Denver Nuggets franchise record for career three-point percentage (.425), and he continues to rank among the all-time leaders in several categories for the Sacramento Kings and the Houston Rockets. Smith joined Turner Sports in 1998, working as a studio analyst for the end of the NBA regular season and the playoffs. Smith works with Ernie Johnson Jr., Charles Barkley, and Shaquille O’Neal on Inside the NBA, a winner of the Sports Emmy Award for Outstanding Studio Show. Smith covered basketball for the 2001 Goodwill Games, and he occasionally appears on NBA TV as an analyst. Smith provided commentary for the MSG Network’s broadcasts of New York Knicks games from 2005–08 and works as an analyst for CBS/Turner during the NCAA Men’s Division I Basketball Tournament. During the 2010 NBA All-Star Weekend, Smith was a member of the Texas team that won the Shooting Stars Competition. While on the Scoop B Radio Podcast in 2017, Smith told Brandon Scoop B Robinson that the 1994 Houston Rockets would have beaten Michael Jordan and the Chicago Bulls had they faced each other in the NBA Finals. To whom Kenny Smith married? Speaking about Kenny’s relationship status, he was married to Dawn Reavis, and with her has a daughter named Kayla and a son named K.J. Having divorced from Dawn, he met Gwendolyn Osborne in 2004, and fell in love with her; the couple married two years later and had a son named Malloy and a daughter named London. However, their relationship fell through in 2018, when they separated and divorced after 12 years. The pair both are doing well in their respective careers even after their separation. As of now, Kenny Smith seems to be single. Further, Osborne had a daughter from a previous relationship, Monique. 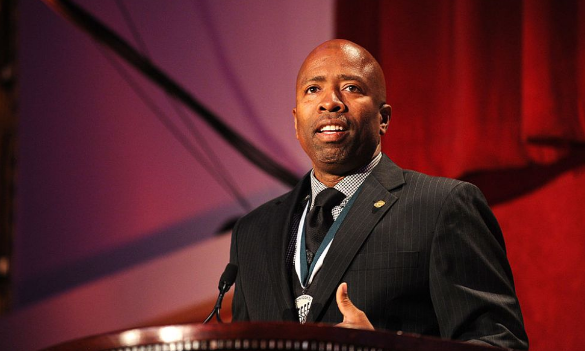 How much net worth Kenny Smith have? He accumulated from his career in the previously mentioned field and subsequently as a TV analyst. According to authoritative sources, his estimated net worth somewhere around $ 16 million. During his NBA career, Smith made as much as $13 million in salary. 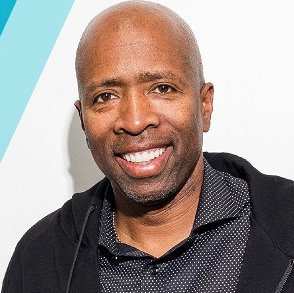 After he retired from playing basketball, Kenny Smith began working with Turner Sports (TS) as a studio analyst for Inside the NBA together with people like Shaquille O’Neal, Ernie Johnson Jr., and Charles Barkley. His salary as an analyst is $4 million per year. He hasn’t disclosed any information about his assets, such as houses and cars, but being a hard worker, he is able to financially support his family. How tall Kenny Smith is? Observing his body figures, He has a good height that qualifies him as a basketball player. He stands tall at about 6 feet 3 inches and weighs around 77 Kg. His other body measurements were not disclosed yet. In the case of disclosed, we will let you know. Professional basketball player with the Sacramento Kings (1987-88 thru 1989-1990[start]), Atlanta Hawks (1989-1990[end]), Houston Rockets 1990-1996), Detroit Pistons (1996-1997[start]), Orlando Magic (1996-1997[middle]), and Denver Nuggets (1996-1997[end]). Selected by the Sacramento Kings in the first round of the 1987 NBA college draft (6th selection overall). Guard for Sacramento Kings (1987-1990), Houston Rockets (1990-1996) and Denver Nuggets (1996-1997). Made NBA debut 6 November 1987.